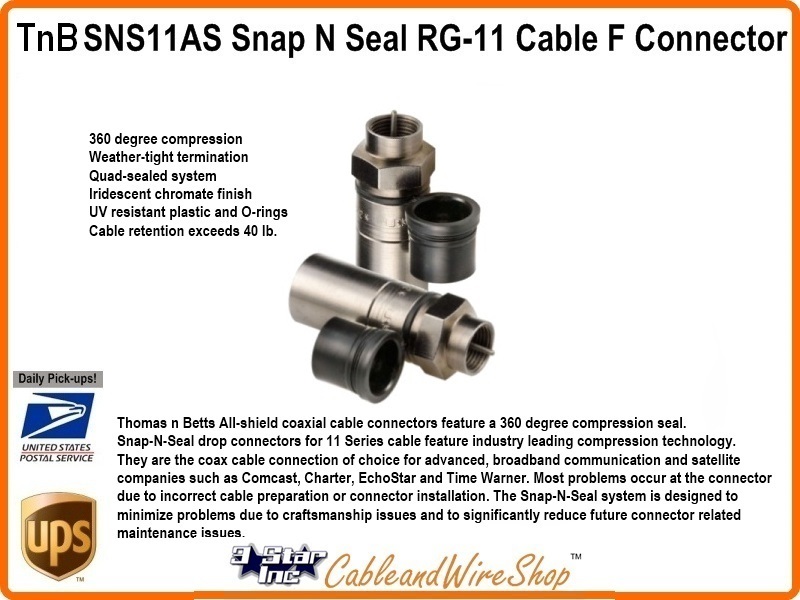 (1 each/unit) Thomas n Betts All-shield coaxial cable connectors feature a 360 degree compression seal. Snap-N-Seal drop connectors for 11 Series cable feature industry leading compression technology. They are the coax cable connection of choice for advanced, broadband communication and satellite companies such as Comcast, Charter, EchoStar and Time Warner. Most problems occur at the connector due to incorrect cable preparation or connector installation. The Snap-N-Seal system is designed to minimize problems due to craftsmanship issues and to significantly reduce future connector related maintenance issues. NoteWe think that this connector is the ultimate in ease of installation and maintenance. We use this connector in the Jumpers we make for the Satellite and TV Industry, every day.